With October being the official month of Breast Cancer Awareness, we thought that our next few blog posts should be tied into that theme. Especially due to the fact that unfortunately, every single knitter and crocheter on this earth has been affected by cancer in some way or another. And while there are fewer realities more troubling than that, knowing that we can make even the smallest amount of difference through our craft can help- if even only just a little bit. 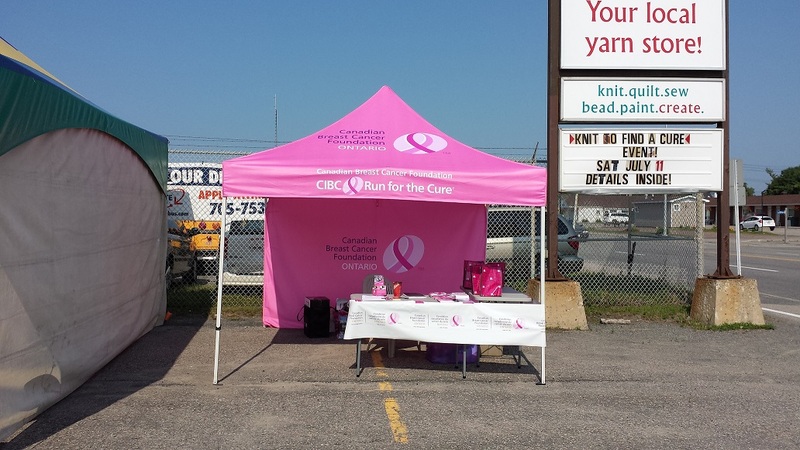 Diane from Diane’s Creative Elements in Sturgeon Falls, Ontario recently sent us some photos of her store’s second annual ‘Knit To Find A Cure’ event that her store hosted this past July. Tents were set up, snacks, drinks and entertainment were provided, yarn was donated… and local knitters gathered together to KNIT! Two blankets were made using Cascade Pacific, and dozens of pairs of slippers were knit and crocheted in King Cole’s Big Value Super Chunky in support of the local hospital’s oncology unit. 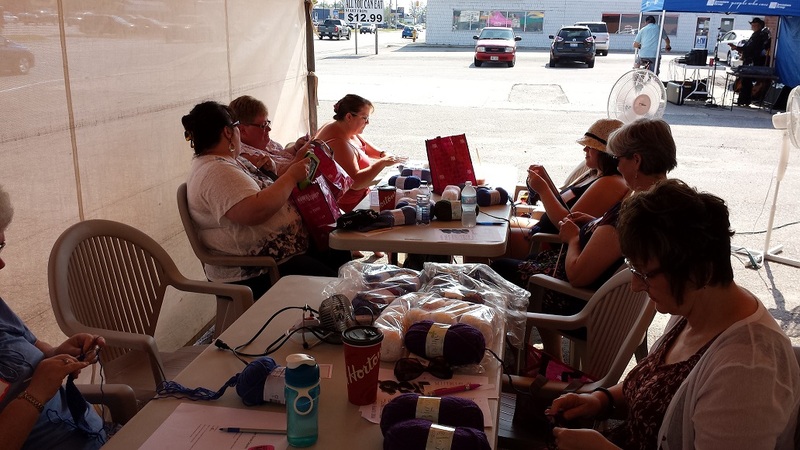 Last year was Diane’s first year hosting the event, and she had twelve knitters gather. 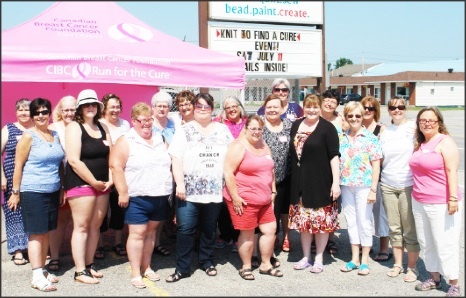 Together they managed to raise $1200.00 in support of the Canadian Breast Cancer Foundation. 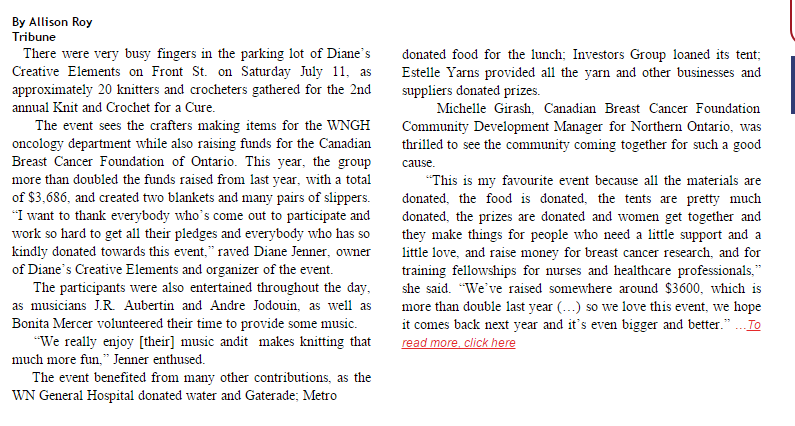 This year Diane managed to rally 20 knitters, and $3600.00 was collected- that’s triple the amount raised last year! To read more about this event, click here to read the article posted in the West Nipissing Tribune this past July. And for those of you who live in the Sturgeon Falls area, be sure to follow Diane’s Creative Elements on Facebook to find out how you can get involved in next year’s event! Congratulations on a job VERY well done ladies!